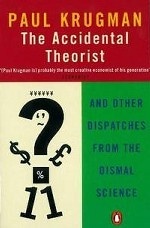 Аннотация к книге "The Accidental Theorist: And Other Dispatches from the Dismal Science"
Paul Krugman has made a reputation for himself by telling us the truth about economics however unlikely it may seem and however little we want to believe it. In this wonderfully cohesive set of sharp, witty essays, Krugman tackles bad economic ideas from across the political spectrum, giving us clear-eyed insights into unemployment, globalization, economic growth, financial speculation, among other topics. The writing here brilliantly combines the acerbic style and clever analysis that has made Krugman famous. Some of the articles have been written in response to particular economic events, but there is no political orthodoxy in them, only rational common sense.